Christmas wedding invitations are gaining in popularity as more and more couples are deciding to tie the knot in the colder months. 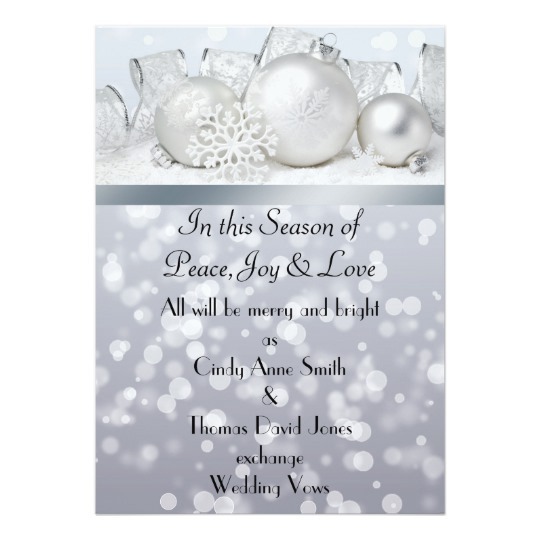 Many brides are looking for Christmas themed wedding invitations or winter themed wedding invitations to reflect not only the time of year that they are marrying in, but also the festive season that they will marry in. Are you one of these brides? 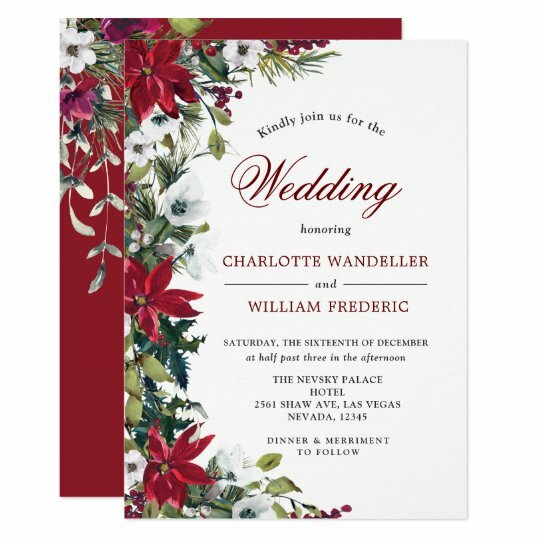 Christmas wedding stationery is a bit harder to find than other themes, but there are still plenty of great selections out there. You should begin narrowing down what you are looking for. 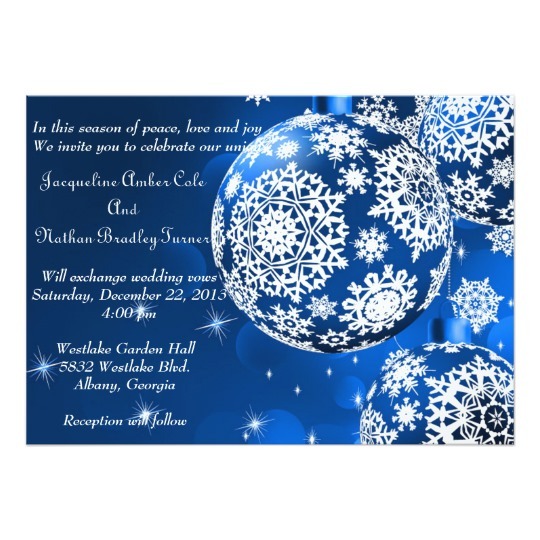 Some of the designs on these types of invitations include snowman, snowflakes, ornaments, holly and icicles. What do you want your Christmas wedding invitation to look like? Here are some ideas to get you started. There are so many ways you can insert Christmas into your wedding stationery. I think one of the easiest and most obvious ways is to use a Christmas Tree on the stationery itself. The Christmas tree is a common sign of the season and it is instantly recognizable. 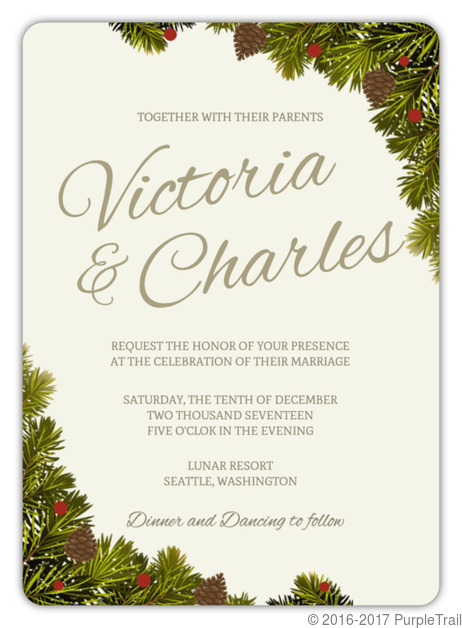 Are you looking for an elegant Christmas Wedding Invitation? Check out the one below. 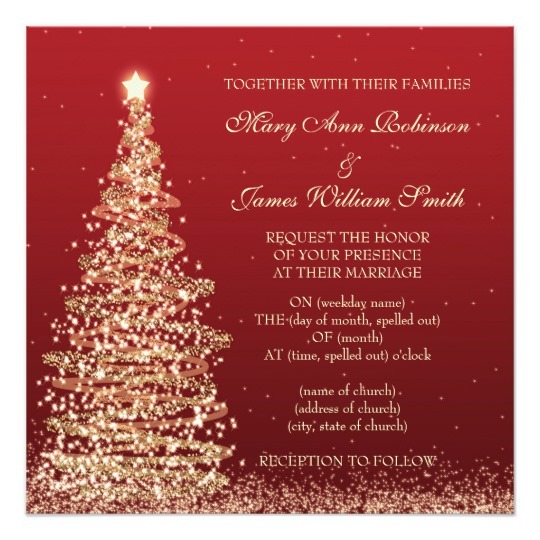 The colors are amazing - with the red overall wedding invitation color and the beautiful lit up Christmas tree. Are you looking for a Christmas tree but something a little more on the vintage side? What about this beautiful outdoor wedding invitation. It shows an outdoor Christmas scene at night, super pretty and romantic. Do you like the idea of an elegant wedding invitation but would prefer something a little more modern and fun? 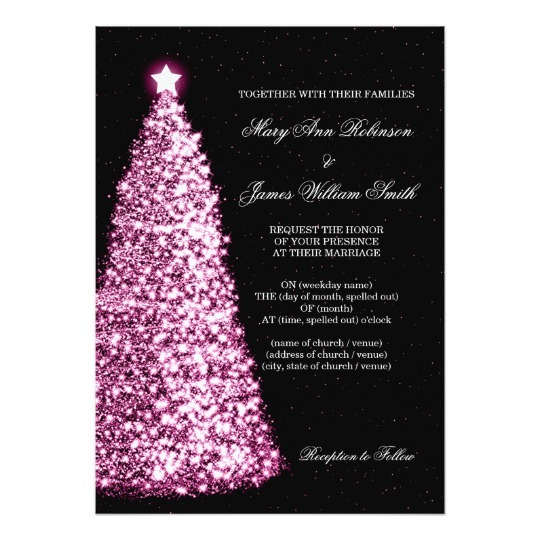 What about the black and pink wedding invitation below? It has an amazing and modern Christmas tree and with the black background the photo just pops right out at you. 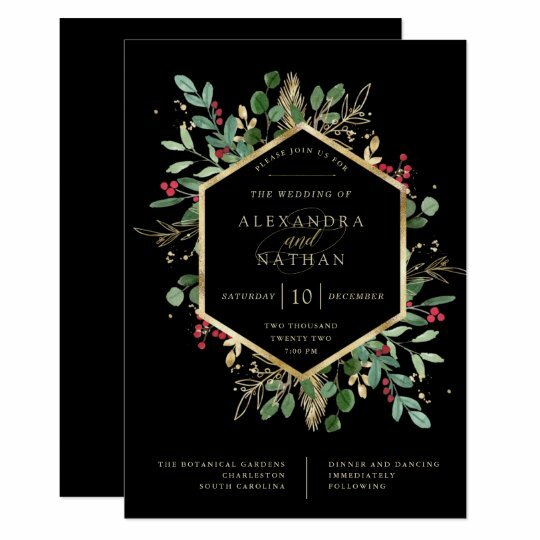 Another popular way to show your love of the season you are getting married in is to choose to display pretty Christmas Ornaments on your wedding stationery. Whereas there are other occasions people can utilize ornaments, decorating for Christmas is the most popular time we bring out all the pretty ornaments. When using ornaments you can easily input your wedding theme or wedding color into the invitations by choosing a specific colored ornament or the wedding card can be specific colors. For instance many people planning a Christmas Wedding choose to use colors such as silver and white to demonstrate the season with decorations such as silver bells,, snow and snowflakes. If this is something you are considering you might like the card below. 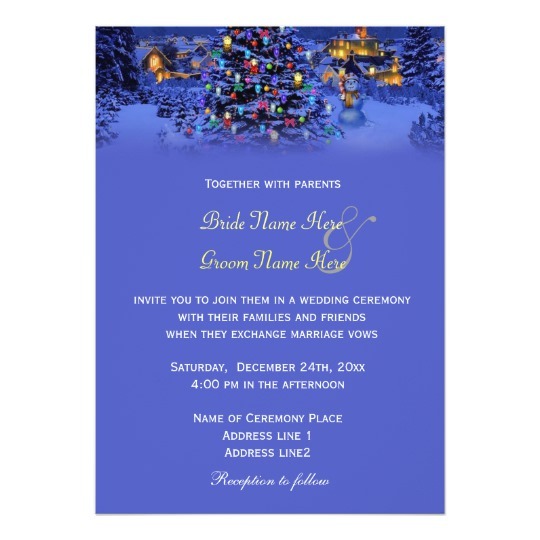 Purple is a popular wedding color for all seasons and if that is your main wedding color you might want to consider using the purple Christmas Ornament Wedding Invitations seen below. Finally one of the more popular Christmas Wedding Color combos is blue and white. 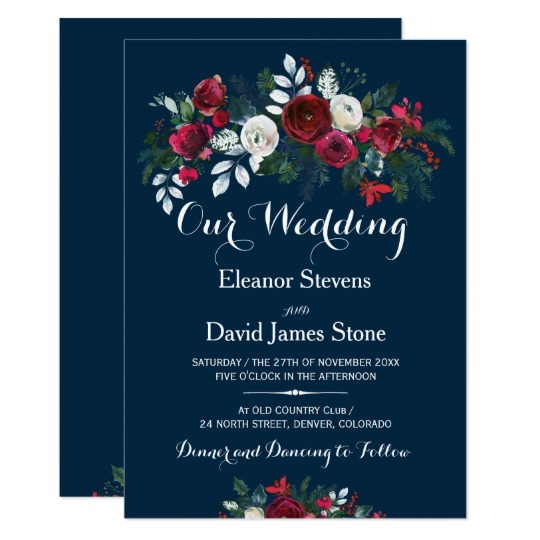 If you have chosen this as your wedding colors you might consider the below wedding invitation. 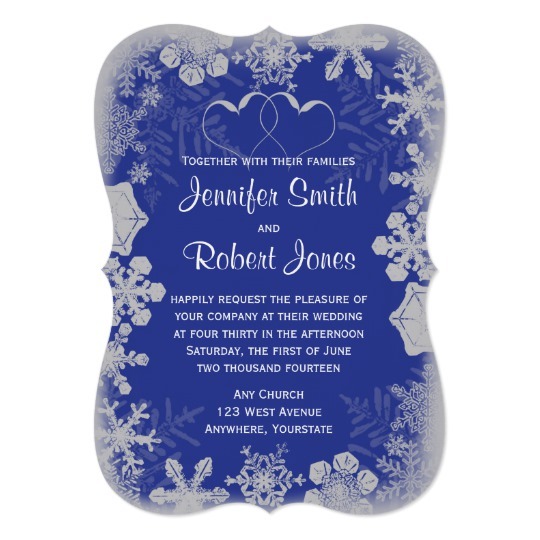 It is beautiful, it combines those two colors wonderfully and as a bonus if the snowflake theme is something you are focusing on this wedding invitation features that as well. Another super fun idea for your wedding invitations is to use reindeer. Reindeer are fun and cute and they totally sell the Christmas Wedding idea without any extra elements. 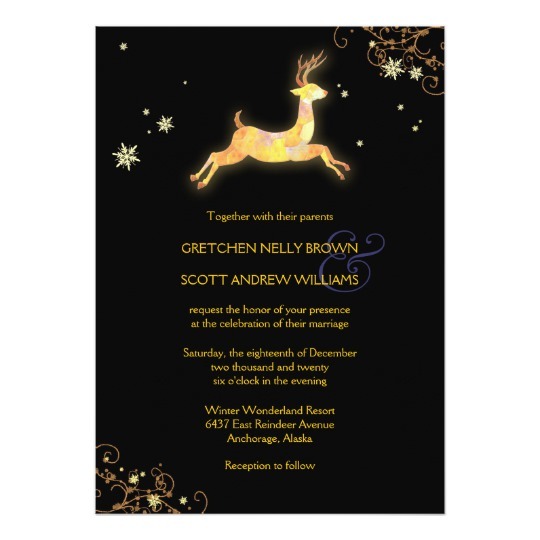 If you choose reindeer as your main design element on the invitation you might choose to have a simple and less cluttered look on your wedding invitation. 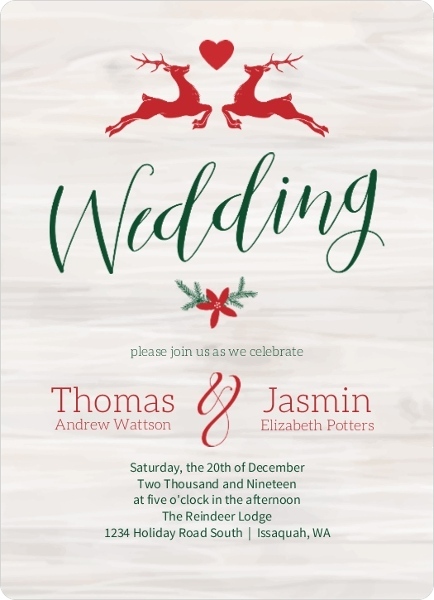 The wedding invitation below is simple and nice with a ton of white space which makes the red and green colors as well as the two reindeer in love stand out even more. Another Christmas element you might want to choose for your wedding invitations is Christmas lights. You could choose colored lights, white string lights or a combination of those two. 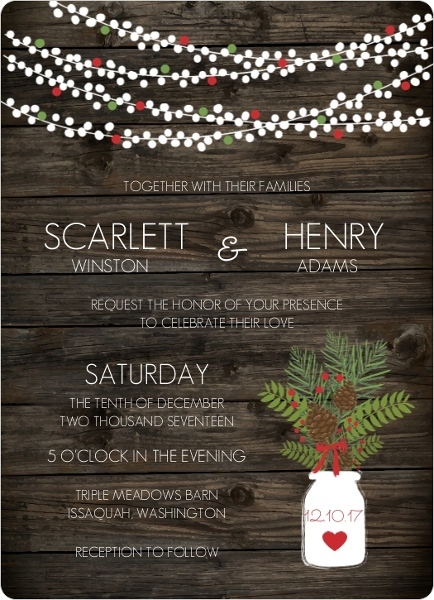 The invitation below is Christmas wedding meets rustic wedding. 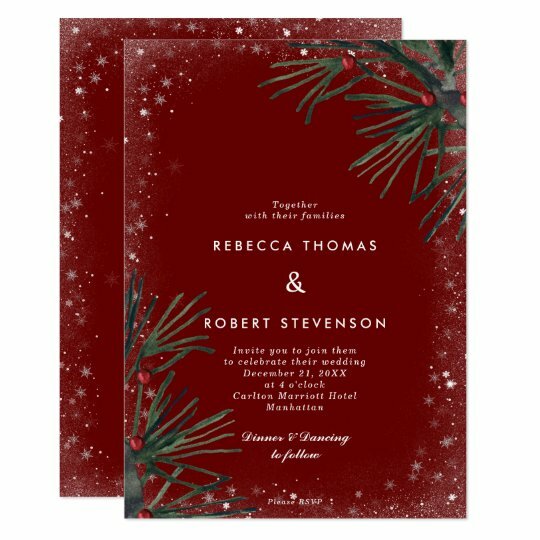 if you are having a Christmas themed wedding but you are not having what you would consider modern, elegant or traditional you might opt for this more rustic wedding invitation. Are you looking for Christmas lights to match your wedding colors? 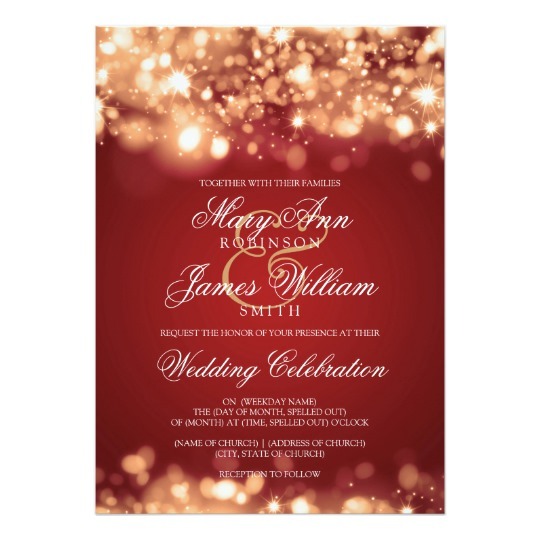 Red and gold are popular wedding color choices for the Christmas Holiday wedding. The lights on this invitation are more decorative and abstract making this the perfect wedding invitation if you are having a modern wedding. Looking for Christmas wedding lights but not into too much color? 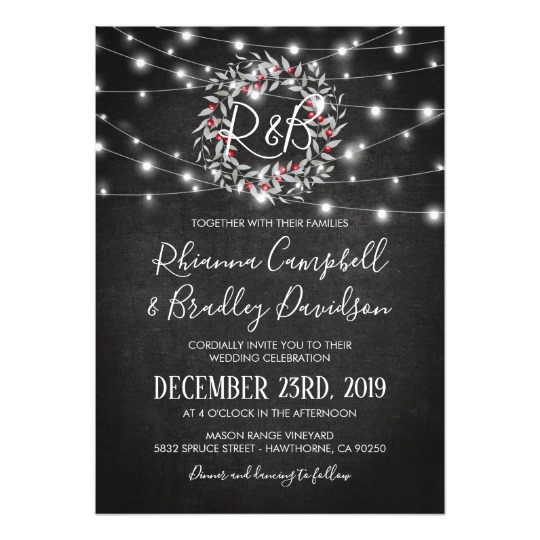 The wedding invitation below is black and white with just a touch of red and besides just featuring Christmas Wedding Lights it also has a super cute wreath! 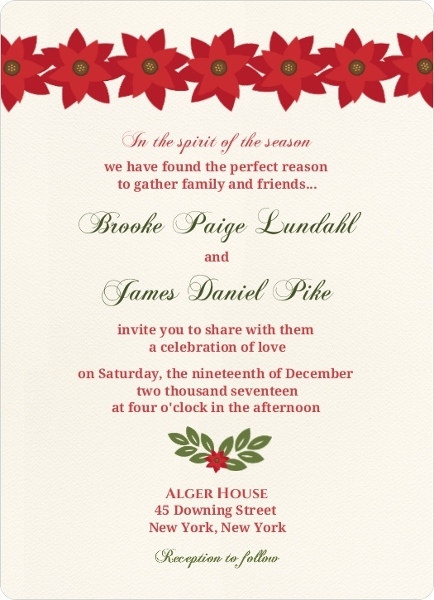 I really like the snowflake wedding invitation below. The black, blue and white color combo is very striking a pretty and the details showing the different sizes and patterns of the snowflakes is very crisp and attractive. Looking for snowflake wedding invitations that are modern and fun? 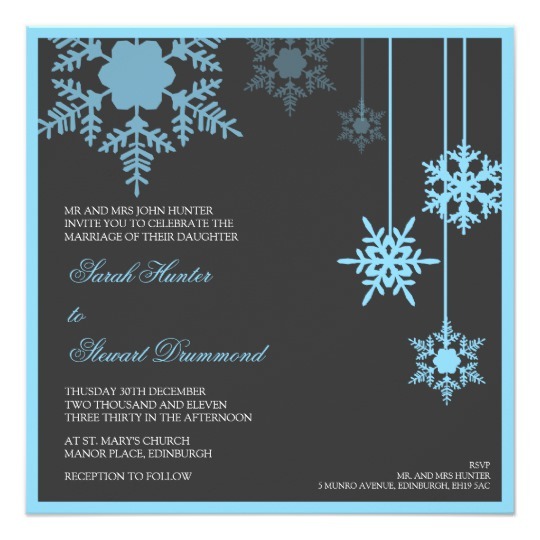 Check out the blue and silver snowflake and heart wedding invitations below. Are you still looking for just the right wedding invitation or maybe you want some more ideas before making a final decision? There are many nature related items that are related to Christmas. Some of these include Poinsettias, Winter Berries, Pine, mistletoe and more. Poinsettias are a popular choice for this time of the year. If this is your favorite winter flower you might want to choose a wedding invitation to reflect this flower - especially if you decide that you want to use them in other decorations throughout the day. Another popular choice is to use either just greenery or a mix of greens and reds. This can be accomplished with pine branches, winter berries, mistletoe and other decorative touches. Some of our favorite choices for these Christmas design elements are below. Well there you have it, many different ways you can use Christmas Wedding Invitations to show your guests that you will be having a Christmas wedding. Remember that many of these themes can also be used in other places in your wedding as well - do not forget to be creative!